Pastor John Kojo Boamah and his family retired from active service on Sunday, July 29, 2018, having served 13 years in the full-time ministry of The Church of Pentecost. In the course of the ministry, Pastor Boamah first served at Agona Odoben in the Swedru Area and was later assigned to Drobo Krupiase in the Berekum Area, where he laid down his tools. With his wife Veronica solidly behind him, Pastor Boamah made great strides in the ministry although he spent a relatively short time working in the Lord’s vineyard. He greatly impacted the lives of members and non-members of the Church whom he encountered in ministry. He accomplished a lot in the Districts he served and also chaired or served on various committees of the Swedru and Berekum Areas of the Church. 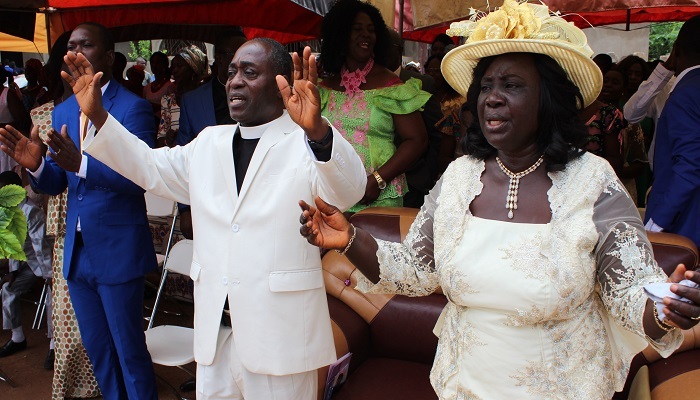 To the glory of God, Pastor Boamah, together with his wife, Mrs. Veronica Boamah, and children have gracefully brought their service to an end after a retirement service was held in their honour at the forecourt of the Drobo Krupiase Mission House. Preaching the sermon titled “A Faithful Man Shall Abound With Blessings” (Proverbs 28:20a) at the event, the Berekum Area Head, Apostle Anthony Kingsley Miah said Jesus Christ was faithful to his Father throughout his life on earth. In the same way, Abraham, Moses, Joseph and Daniel faithfully served the God and were greatly blessed. He, therefore, stated that anyone who serves the Lord wholeheartedly would abound in blessings. Eulogizing the retiring minister, Apostle Miah said that Pastor John Boamah was a faithful servant of God because he was very committed to whatever task he was given, both at District and Area levels. He further described him as one who works without discrimination or partiality. The Berekum Area Head also acknowledged Mrs. Veronica Boamah for her zeal, commitment and exemplary prayer life, and prayed for divine blessings for the Boamah family even as they retire from active service. In response, Pastor John Boamah, on behalf of his family, thanked God for successfully seeing them through their ministerial journey. He was also grateful to Pastor Bright Senay, all Area Heads they served under, as well as ministers, officers and church members who have in diverse ways supported them in ministry.